Look at this adorable guy! Oscar has now settled in to his foster home and we are getting a good read on him. He is super smart, active and full of personality. He is all character! He definitely will need an active person or someone who is okay sending a pup to daycare. He just started daycare at Cottonwood, and loves it. Oscar is really a pretty fun dude - he loves his people and everyone who he meets - enjoys playing with dogs but really loves people the most. He currently lives with 2 dogs and 2 cats, but he'd happily live alone if it meant that ALL the attention and love went to him. If you sit down, Oscar will want to melt into your lap. He enjoys snuggling up under your chin and leans against you. He is a total lover. He can be a tad reticent with strangers, but if you give him a minute he will warm right up. He is always excited when people come to visit. Weighing in at 12 lbs, he is amazingly agile and would be up for adventures. He is incredibly smart and loves to learn. He is currently starting clicker training. He is good in his crate and housetrained. In the car he can hang while you do groceries, but **bad habit alert** he does like to sit in your lap when driving, so a crate or a tether is probably safest route for car rides. He would be a fabulous dog to take on long hikes, and if he ever got tired, he could go in a backpack. Seriously - a wonderful little guy for the right person. He would not make a good sidekick for someone who works a 9-5 and leaves him home all day, honestly I think he would be a nightmare if left alone and bored all day. He needs snuggling, exercise and mental stimulation and he will be a dream dog. He has decided chasing the cats is fun - so ideally a cat free home (for the cat's sake). 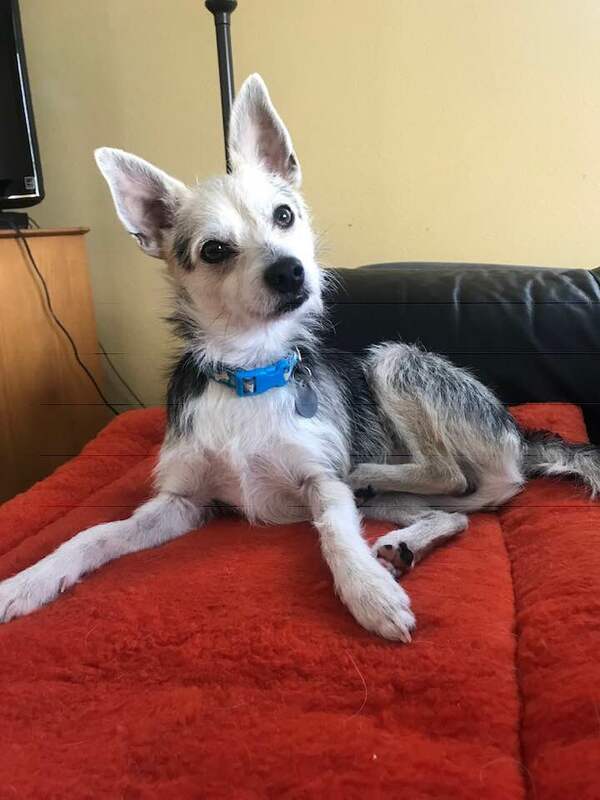 For more info and/or to apply to adopt Oscar, go to the top toolbar, click Adopt, click Dog Application; then fill it out and send it in. A volunteer from Summit Dog Rescue will get back to you as soon as they can.